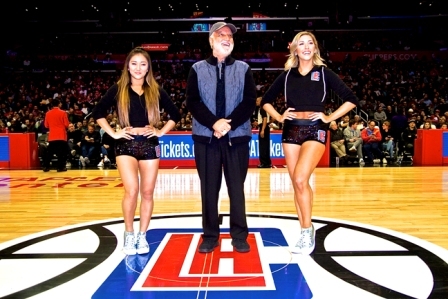 During the NBA’s L.A. Clippers vs. Houston Rockets game at the Staples Center, the Clippers organization honored Danny Bakewell, Sr. as one of Tobi’s Heroes, a Clippers player-inspired program that honors people in the community who inspire children through sport, community service or education. Bakewell was recognized for his longstanding social activism and leadership on center court, Monday, Jan 15, on a day the world took pause to remember the life and influence of the 1964 Noble Peace Prize recipient and civil rights leader Dr. Martin Luther King Jr. “Dr. King was and is still the voice of equality for African Americans and humanity as a whole; I am honored to be here celebrating the birthday of Martin Luther King. I am so pleased,” said Bakewell. Bakewell, Sr. was born in New Orleans and came to Los Angeles during a turbulent time of 1960’s civil unrest that saw Blacks fighting for equal rights. He became the Director of New Careers at UCLA, where he combined academic and social consciousness. From there, later came the opportunity to head the Brotherhood Crusade. Through Bakewell Sr.’s guidance, the organization has provided more than sixty (60) million dollars to community programs and services throughout Los Angeles. After the 1992 L.A. civil uprising, Bakewell lead a campaign to create equal construction job opportunities for African Americans during the rebuilding process, coining the slogan, “If we don’t work, nobody works.” Today, Bakewell continues to support community development, as Chairman of the Bakewell Company, one of the largest African-American owned companies in the U.S., with media holdings that include WBOK Radio station in New Orleans, Louisiana, the Los Angeles Sentinel and the L.A. Watts Times newspapers. The Los Angeles Sentinel is the oldest and the largest Black-owned newspaper on the West Coast and has been named the nation’s Number One Black Newspaper. Bakewell is the President Emeritus of the National Newspaper Publishers Association. He is also the founder of Taste of Soul in L.A., the largest one-day street festival in California, with over 350,000 attendees on Crenshaw Blvd. When asked about the Brotherhood Crusade’s role in urban communities by Clipper’s in-arena host Frenchy, Mr. Bakewell stated, “It [Brotherhood Crusade] is the largest non-profit self-help organization in the country. We have a tremendous youth training program. The organization raises money to support health, education, and social welfare programs, and the organization really develops programs that allow the community to have a quality of life that they otherwise would not have,” he said. Now with another team, Chris Paul was giving a standing ovation and video tribute in his first game back in the Staples Center as a Rocket. During his Clipper playing days, Paul was very involved with the Brotherhood Crusade, even donating a computer lab and state-of-the-art computers and equipment to local teens, in support of after school programs. “We take our hats off to the those players who do this, and we really applaud the Clippers for what they do in the Los Angeles community. We are forever grateful for their support to the Brotherhood Crusade. Because of the athletes who get involved, we can make a big difference in the communities we serve,” Bakewell said.